I did pretty well on this challenge in 2017 and decided to try it again in 2018. I have a few eArcs from both Netgalley and Edelweiss I need to get through so this challenge provides me with the perfect opportunity to do so. The challenge will run from Jan 1, 2018 – Dec 31, 2018. If you have any questions tweet Katrina @BookishThings or e-mail her at katrina@bookisthingsandmore.com! I am aiming for the silver level once again, but this time I will try to read 35 books. The New Release Challenge, a year-long challenge is hosted by LEXXIE @ (UN)CONVENTIONAL BOOKVIEWS , in which we aim to read books released in 2018. Books have to be released and reviewed in 2018. Other challenges can be used as well, if you are participating in the Netgalley / Edelweiss challenge or in the COYER challenge, books can count towards more than one challenge, as long as the ones you use for the 2018 New Release Reading Challenge qualify to the other rules. 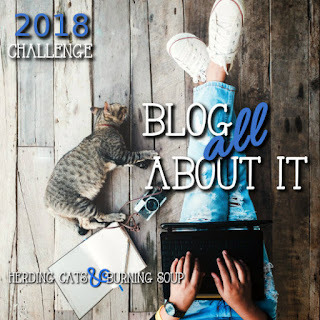 The New Book Release Challenge is open from January 1st through December 31st 2018, and sign-ups are open until September 1st 2018. I did not do so well on this challenge in 2017. However, I have decided to try it again. All those review books that somehow slipped through the cracks and just didn't get reviewed when they should have. This is just a fun way of making it right and getting those old review copies reviewed. Any format you accept the review copy counts. I am aiming for 30 books. A tad bit ambitious, but I am still going to try. Wish me luck. Welcome to the Author Love Challenge 2018. This is, by far, our most low-key challenge. We started it late last year and even though I don’t think either Michelle or I made our goal, I know I came a lot closer to finishing off my author and for that I’m thrilled! We hope you’ll join us in giving that special author some love! Set a goal to read x number of books by that author by the end of the year. You can make your goal to read all their books. You can read at least five books from the author's list. Announce your participation, author, and goal in a blog post, goodreads post, FB post. Sign up by December 1, 2018. The author I am choosing for this challenge is Cynthia Eden. I plan to read least one book per month. It's incredibly flexible but also a good way to spread your blogger wings. I think it'll be fun to see how differently people decide to blog about the exact same prompt. I love the idea for this challenge. I'm looking forward to taking part. The prompts are a challenge, but that is what makes it fun.